Common reasons are genetic predisposition, stress, diet deficiencies and hormonal imbalance. Female pattern baldness is generally more accentuated at the crown or top of the head. Conditions affecting the immune system can cause hair loss. Much like the growth of grass, plants and other vegetation is dependent on what goes underneath the soil, the growth on your head is dependent on what goes on inside the scalp. Given normal conditions for hair loss and fall cycle, women would enjoy normal hair. The problem occurs when something messes with the normal cycle of hair. This could be genetic, hormonal disturbances, diet deficiencies, reaction of skin conditions to medications, immune system problems and stress. The hair begins to thin on the top and the crown of the scalp, and usually starts with the widening through the center hair part. Then the hairline in the front remains. It is found that for women the hair loss can rarely progress to total or near baldness as compared to the cases of men. 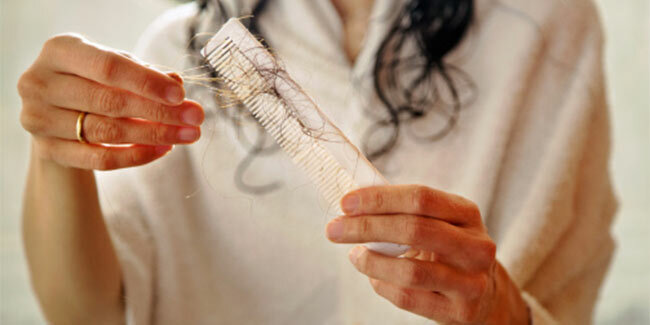 History of hair loss in the family is very often the cause of hair fall in women. Such hair loss is usually female pattern baldness. Every individual loses hair everyday but the problem arises when it does not grow back. Female pattern baldness is generally more accentuated at the crown or top of the head. Some hormonal changes lead to hair loss in women. These changes can occur during pregnancy, birth control, problems of thyroid and menopause. In case of some temporary hormonal changes such as pregnancy, start of hormonal contraception or thyroid problems, the hair grows back as soon the hormonal processes return to normalcy. As women produce less of oestrogen during menopause, and more of hormones such as testosterone, hair loss can naturally result. Women can lose hair when they lose weight rapidly due to deficiency in diet. This is one of the reasons why crash diets are inadvisable. The diets low in protein and iron make the hair thin. If lack of proper nutrient intake is the cause of hair loss, it can be reverted by improving the diet and replenishing those nutrients. Sometimes there is a very little iron, vitamin B or other vitamins in the body.